Magic Johnson has left his role as President of Basketball Operations of the Los Angeles Lakers. Two years and two months after his reintroduction to LA, the man instrumental in the branding of the showtime Lakers has made his third exit from the City of Angels. But as has been the hallmark of Magic Johnson’s career, he pressed the issue. In 1994 he rejoined the Lakers, initially as a coach, replacing interim instructor Bill Bertka. After assessing his options, he returned to the hardwood on January 29, 1996, ironically against the Golden State Warriors, the same team he was enlisted to help topple in 2017. Johnson would only play for the remainder of the 1995-96 season, choosing to retire following a first-round playoff loss to the Houston Rockets. This time however, his second exit, established the narrative that continues to follow Johnson 23 years later. He’d do it on his own terms. The inception of Magic Johnson’s presidential career with the Lakers came at a contentious time. Team president Jeanie Buss hired Johnson on February 21, 2017, just two days before the trade deadline and moments after firing her brother Jim Buss. At the time, the Lakers were 19-39. Well out of the playoff race, Los Angeles had suffered a 26-point loss to the eternally struggling Phoenix Suns just six days prior. Saddled with huge contracts endorsing Luol Deng and Timofey Mozgov, the team was even over the salary cap despite lacking a roadmap to success. Though Buss, as it’s now understood, encouraged Johnson to wield his newfound power unilaterally, he was initially reluctant to do so. The first two months of his tenure was void of roster changing moves, save for sending and recalling David Nwaba and Ivica Zubac to the Lakers’ then-G-League team, the Los Angeles Defenders. It wasn’t until after the 2017 NBA Draft that Johnson faced his first big decision: who plays point guard? D’Angelo Russell was the Lakers de facto point man, having inherited primary ballhandling duties after Kobe Bryant reluctantly relinquished them (60 shots, really?) to retire in 2016. Despite improvements to his numbers across the board, Russell couldn’t shake the stigma of being the point guard for a losing team, and his habitually showboating and immature antics weren’t doing any favors. Johnson’s decision to move on from Russell was as much a compliment as it was a slight. Since his HIV diagnosis in 1991, and even before then, Johnson had been in the business of uplifting those around him. Being president of basketball operations requires making tough decisions, but Johnson wasn’t about to make them without giving players their due respect. Unfortunately, those compliments began to dig Johnson a deeper hole than even his 6-foot-9 frame could escape. Days after trading Russell to the Brooklyn Nets—where he has since become an all-star—Johnson hit new draftee Ball with the biggest ego boost a rookie can get. We’re talking Blake Griffin “this is your life as a Clipper” levels of aggrandizement. By June 23, 2017, Ball was, “the new face of the Lakers,” and expected to see his Jersey hanging from the rafters. Magic just told Lonzo to look up at the jerseys on the wall (including his own, of course): “We expect a Ball jersey up there one day." There’s no easy way to tell a 19-year-old that he’s been given the keys to one of the most historic franchises in the NBA, and Johnson’s way surely wasn’t it. Though he made his remarks through one of his patented ear-to-ear grins, he effectively sicced an international fanbase on a kid with a wonky jump shot and even wonkier father. From here, Johnson’s presidential tenure is lukewarm at best. In August 2017 the Lakers were fined $500,000 for Johnson’s not-so-subliminal courtship of then-Indiana Pacer Paul George. Then there was the February 2018 deadline trade that sent Jordan Clarkson, who Johnson had previously challenged to win Sixth Man of the Year, to the Cleveland Cavaliers. He made moves to acquire a misfit cast of characters after enlisting LeBron James only for said characters to have personality meltdowns ahead of the realization that their future in Los Angeles is anything but secure. Try as he might to stay within his usually jovial character, Johnson had to make the tough decisions. He couldn’t work out with Ben Simmons. He couldn’t congratulate Russell Westbrook. He couldn’t fire Luke Walton for failing to solve a problem he knew couldn’t be solved. Magic realized he couldn’t keep everyone happy, and by extension, that sabotaged his own wellbeing. The Lakers are a cutthroat organization. It’s a team that traded one of the top-10 players of all time—Shaquille O’Neal—because of bad blood between he and Bryant. Los Angeles made its name not by simply finding home grown talent, but by amassing superstar after superstar to create a beacon of basketball success while leaving everyone else out to rot. Ironically, in his final act he became the very person the Lakers wanted him to be. He didn’t meet with his “sister” Jeanie Buss to confirm his decision. Nor did he call to biggest, most ostentatious LA press conference to resign. 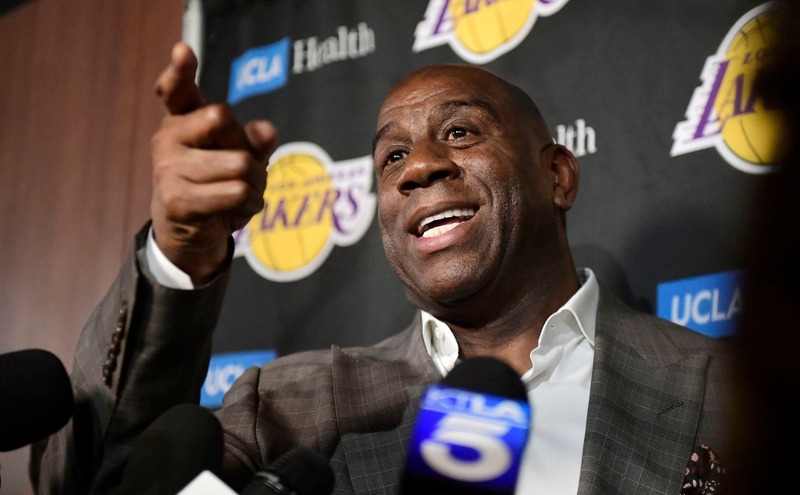 In one swift motion, Magic went from being a Los Angeles legend to a cutthroat businessman and backstabbing coward. But none of that matters. Because now, Magic can be exactly who he wants to be.